Successfully Added 5 Inch On-Camera DSLR Monitor - HDMI Cable, Sun Blind to your Shopping Cart. 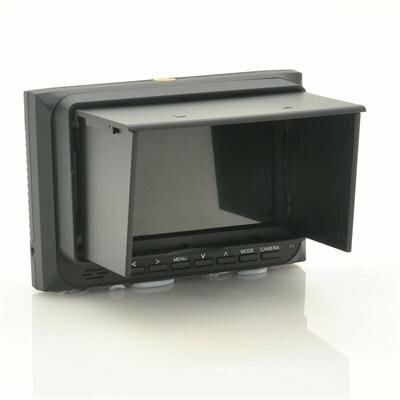 On-camera 5 Inch DSLR monitor for is the perfect camera accessory for making your life easier and pictures clearer when snapping pics or taking videos with your DSLR camera! This DSLR camera monitor comes with a hot shoe mount and a handy HDMI cable so that you can simply take it out of the box, plug it in and away you go! Producing a fine and clear picture with a bright and full color display. Even when used in the sunlight this DSLR monitor is easy to view, using the handy sun blind accessory. Direct from the factory, this product is about 4 times cheaper than the same exact branded model that’s currently selling at major online resellers. Order now and we’ll express ship your order and even back it with our full one year warranty. Brought to you by the leader of high quality camera accessories and low price wholesale electronics, Chinavasion. The monitor can mount to any existing equipment using the screw holes (standard tripod thread) at the bottom and side. Use this monitor with your camcorder: As long as you have a way of mounting it to your camcorder. Most people who use this with their camcorders already have a steady cam rig or shoulder rig, so it can mount with your existing hardware by using the tripod screws located at the bottom and side of this device.